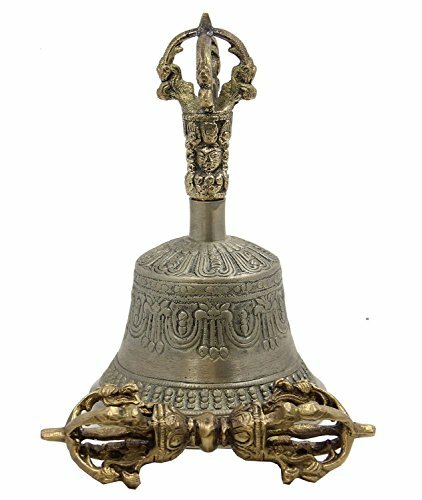 Large Handcrafted Solid 7 Metals Five Spokes Bell and Dorje set. Bell decorated with Embossed Tibetan Buddhist Dorji (Vajra) and Victory banner. Bell measures approximately 6" Tall and 3" Wide. Each Hand Crafted Bell (Thilbu) is made of seven metals alloy of bronze exclusively. The Bell Has Great Sound - It can be also used to call practitioners for Meditation, Yoga or Family for Dinner. If you have any questions about this product by Indian Accent, contact us by completing and submitting the form below. If you are looking for a specif part number, please include it with your message.